I have been on the hunt, people. 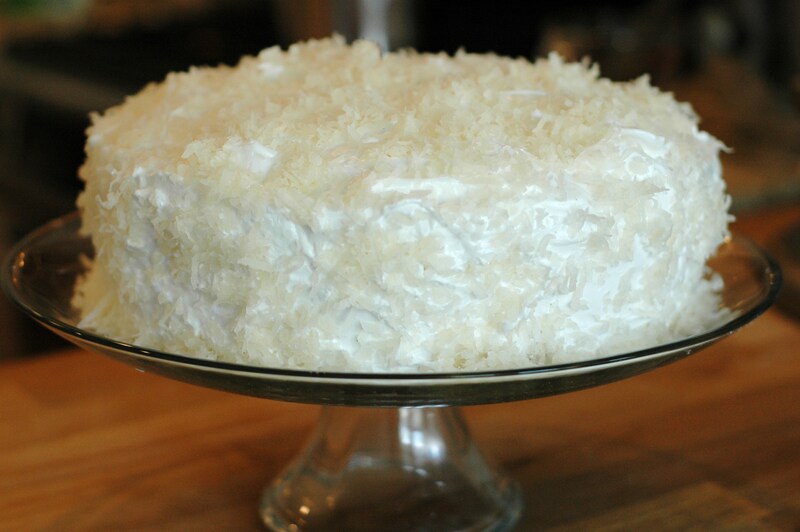 A few weeks ago, while browsing some food sites, I saw a picture of this beautiful, towering, white coconut cake. I was completely smitten. But looks can be deceiving, because as I read the recipe, I realized that this was just never going to happen for me. It involves things like buying whole coconuts, extracting the milk, and using a hammer to get out coconut meat. It all sounds very nice, really, but… whatever, it’s just not going to happen. 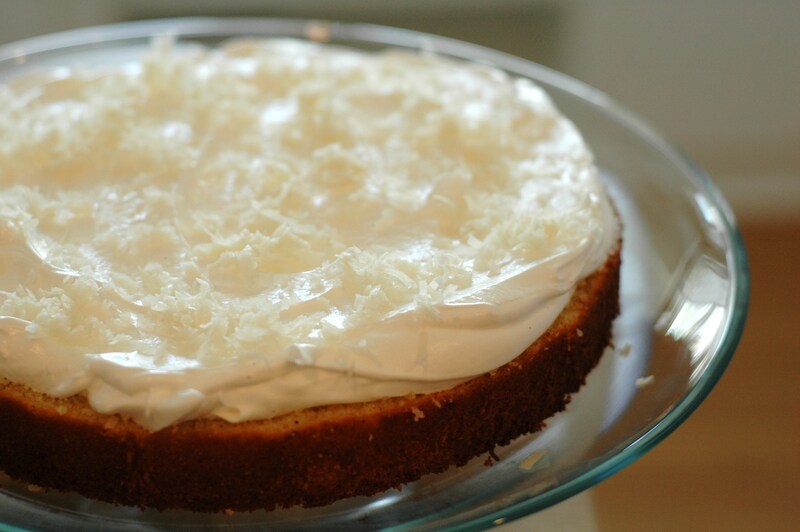 Even with that realization, though, the craving for a fluffy, dazzlingly white coconut cake didn’t leave me. I just couldn’t get it out of my mind. I wrongly assumed that there had to be plenty of coconut cake recipes out there for me to try, that would suit my tastes and not involve borrowing a hammer from my husband. Oh how wrong I was. I couldn’t find a single recipe that was exactly what I wanted. You’d think that with all of the information floating around on the internet, all my cookbooks all over the house, and stacks of food magazines piled up next to the sofa, I could find something that would satisfy me. Nope. I gave up for a little while, but this goofy coconut cake idea won’t get out of my head and so today, I did something I rarely do while baking. I made up my own recipe. Of course, this is all well and good when you’re cooking and you can taste as you go, etc. But I always get a little bit worried after a decision to wing it when it comes to baked goods. But I was desperate. 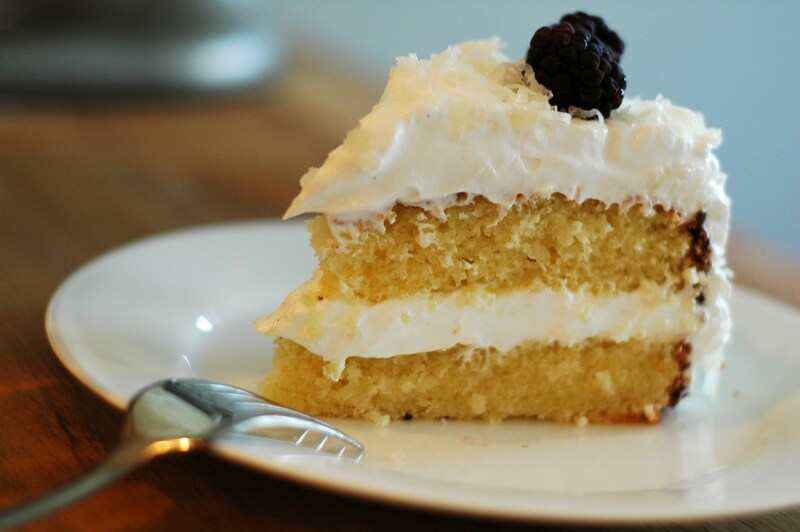 The end result was more or less what I hoped for- a moist, deeply coconut- and vanilla-flavored cake, chewy with bits of coconut; light, fluffy, deliriously sweet frosting; a healthy sprinkle of more coconut on top of those fluffy mounds of frosting. It’s not quite perfect… I might make a few tweaks next time, such as adding a layer of lemon or lime curd between the layers or using a bit less frosting (it’s very sweet). But this cake is fabulous as it is now… especially because it has a high impressiveness factor and is relatively simple to make. It would be a great one to take along to a party or to use as a birthday cake. For me, the fact that I finally got my coconut cake is reason enough to celebrate. Preheat oven to 350 degrees F (175 degrees C). Grease and flour a 10 inch springform pan. In a smallish bowl, mix flour, baking powder and salt together and set aside. In a large bowl, cream the butter and sugar until light and fluffy. Add eggs one at a time; beat well after adding each one. Mix in vanilla extract. Add flour mixture alternately with coconut milk, mixing well with each addition. Fold in coconut. Pour batter into prepared pan. Let cool for 10 minutes. Run a sharp knife around the edges of the pan, then release cake ring of springform. Transfer cake to a cooling rack and let it cool completely before frosting. Combine sugar, water, cream of tartar and salt in a heavy saucepan. Scrape the seeds from the inside of the vanilla bean and add them to the saucepan. Cook over medium heat until the mixture is clear. 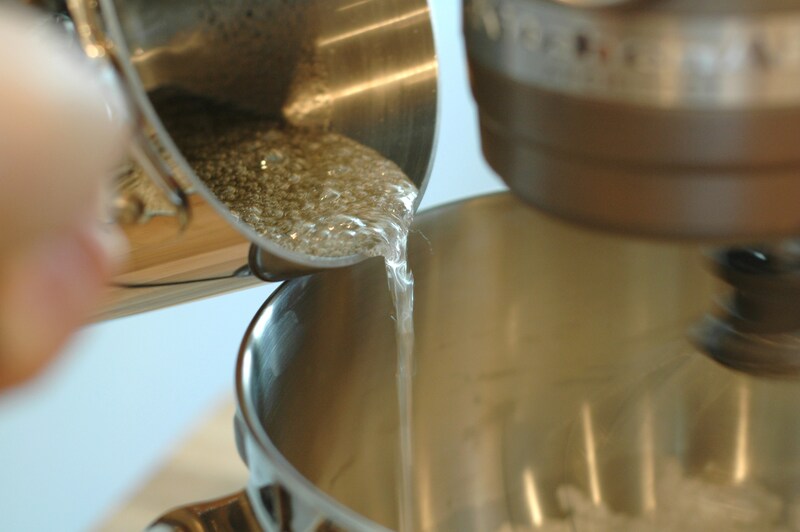 Continue to cook, without stirring, until a candy thermometer reads 240 degrees F.
While the syrup cooks, beat egg whites at high speed with an electric mixer until soft peaks form. If at this point, your syrup hasn’t cooked enough yet, you can leave your mixer on at the lowest speed, so the whisk is slowly stirring the egg whites. This will keep the whites from falling until you’re ready to add the hot syrup. When you’re ready to add the syrup, turn your mixer back up to high speed, and add the syrup in a steady, thick stream into the whites. Continue beating until stiff peaks form and the frosting becomes thick and spreadable. 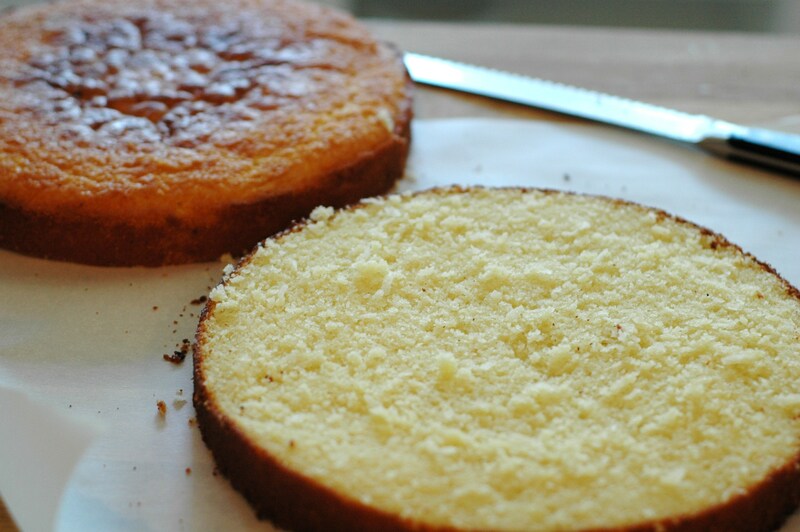 Split the cooled cake in half horizontally, using a serrated knife. Transfer the bottom half of the cake to a stand or plate. Spread frosting on top of the bottom layer, then sprinkle about 1/4 cup coconut on top. Place the top half of the cake on top of all this, and then use the rest of the frosting to cover the cake . 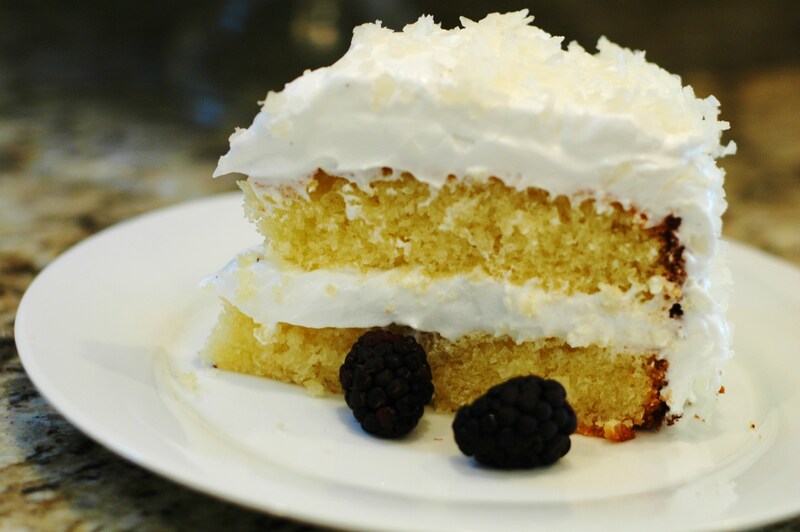 Sprinkle the rest of the coconut on the top and sides of the cake. You could also leave the rest of the coconut off, since the frosting is beautiful all on its own. Thank you for making my favorite cake! As one of ten kids, we rarely got special treats, but on our birthday, we could request whatever kind of cake we wanted. I always chose coconut! I will definitely give this a try! You’re just a quick drive on the Ike away to a big ole piece with your name on it! Greetings from Sydney Australia. Thanks so much for posting this recipe! I had asked my son what kind of cake he wanted for his birthday on the weekend and he said his favourite flavours are vanilla and coconut. I googled this and found your website. 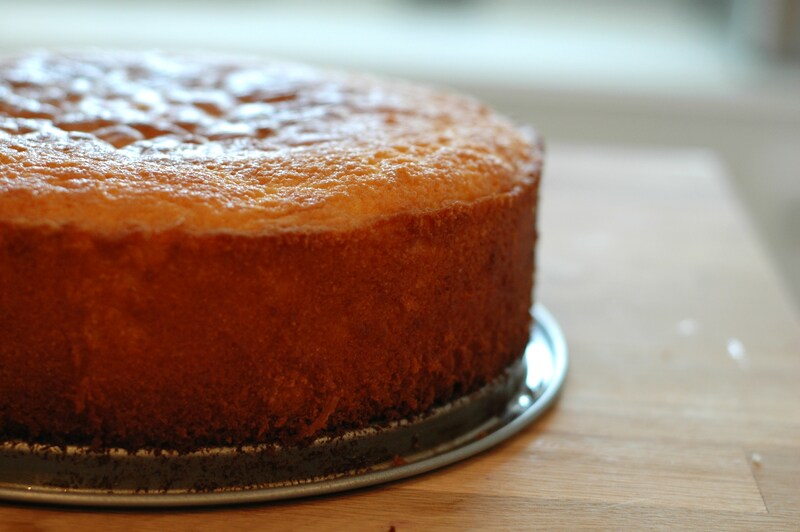 The cake was a huge success – delicious, moist and easy. Will definitely make it again. Thanks!!! Hi, Anne! So glad that you (and more importantly, your son!) liked it. In my opinion, nothing’s better for a birthday cake than coconut and vanilla! Wow, this looks amazing! I think I’m going to try making it tonight for Australia day! I might use cream instead of frosting though. Really sweet things taste delicious, but make you feel sick afterwards! Thanks so much for posting it! I’ve substituted an icing made from a couple of cups of sifted icing sugar (I think it’s called confectioner’s sugar in the US? ), mixed with about 2oz of melted butter and a couple of tablespoons of coconut milk – just enough to make it spread easily over the cake. It was yum! The cake batter is such a generous recipe, I’ve also had success dividing it between two 8 inch round tins so I end up with two cakes. That sounds fabulous- I think I’ll have to try that next time! Hi Donna! I’m so glad you guys like it! The consensus seems to be that for most people, baking it in two pans is easier, because then there is no need to torte (or cut the cake in half to make two layers). Although being a bit lazy myself, I appreciate only having one pan to clean afterwards. 😉 Thanks for coming by! My daughter: “This is the best cake I’ve ever eaten. And I don’t even like cake!” LOL Everyone LOVED this cake. I added a coconut cream filling. I will definitely make it again. I can’t believe how moist and delicious the cake was! Thank you! Love the idea of adding the filling! I think I’ll have to try it that way soon. Glad everyone enjoyed it!